Bruce's Vintage Watches : Fine timepieces at reasonable prices from a name you trust. Fine timepieces at reasonable prices from a name you trust. In business since 1989 and offering medium- to high-grade watches with an unconditional seven-day money back guarantee. To the best of my knowledge, this is the model 146, equipped with the first Curvex caliber, the 311. The style number inside the case is 238, which dates the watch to year 1936, according to Mike Barnett's Online Style Number Date Calculator. The case is 46mm lug to lug by 20mm wide, not including crown. Case looks good from the top, but all four lugs have splits on the back, which is very typical for this model. Back is monogrammed "NWR". 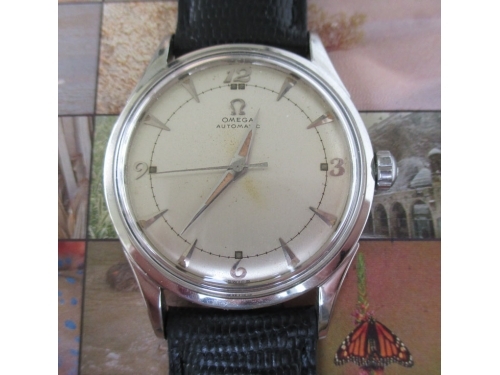 Average condition older refinished dial (no SWITZERLAND at bottom). 17 jewel caliber 311 Curvex movement winds and sets perfectly, keeps to within 2 min/day but not known when last serviced. Good condition 14mm black leather band. These early Curvexes are getting harder and harder to find. Gruen only made the Caliber 311 for two years (1935-1937) before introducing the next model in the Curvex series, the 330. Excellent to near-mint all stainless steel screwback case measures 40mm long lug to, by 33mm wide, not including winding crown. Pierced lugs. Excellent original dial with radium burn at about 5:00. Signed replacement crown. Good crystal. 17 jewel caliber 351 movement has just been serviced (clean/oil/adjust) winds perfectly and keeps good time. New 18mm black leather band. These vintage Omegas just keep going up, up, and up. Very clean example here. Here we have another solid gold electric, this one a little later model, introduced in 1960 with the newer version caliber 505. The Polaris was first introduced in 1960 in yellow gold, and a white gold version was released in '62. This is obviously the yellow version. This is one of the few electrics to have a "sister watch" with mechanical movement, that being the "Lord Lancaster E." Notice, too, how the crystal is also asymmetrical, forming a teardrop that narrows at the 6:00 position. I put a new battery in this one, and it takes off with a gentle "shake" of the case and runs continuously and keeps time to within 2 min/day or better. Again, this beautiful example is offered at a very reasonable price, I see them on the 'net at double what I'm asking. Excellent 14kt solid gold assymetrical case with screw back. One tool mark on back as seen on image. Excellent original pearl white dial. Replacement unsigned crown. Just cleaned, oiled, and adjusted by a qualified watch technician, with fresh battery installed. Just push to the crown in, and she starts and keeps time to within 2 min/day or better. Used but serviceable 18mm black leather band. 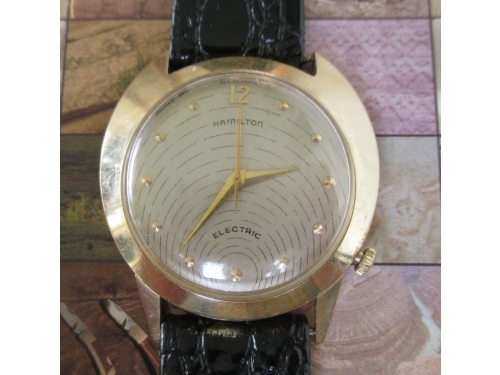 The Spectra was introduced in 1957, and was the third watch in the Electric series, following the Ventura and Van Horn. 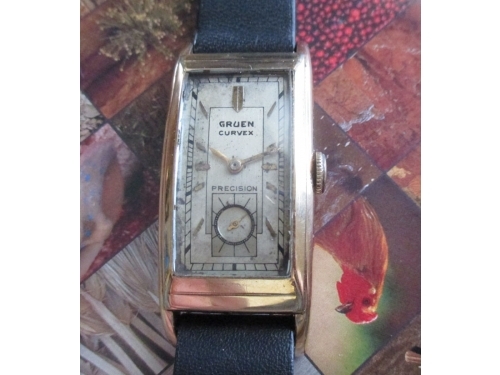 It features a heavy solid gold case with a screwback. While not specifically one of Richard Arbib's designs, its off-center saucer design is reminiscent of Arbib's tendencies toward the asymmetrical. 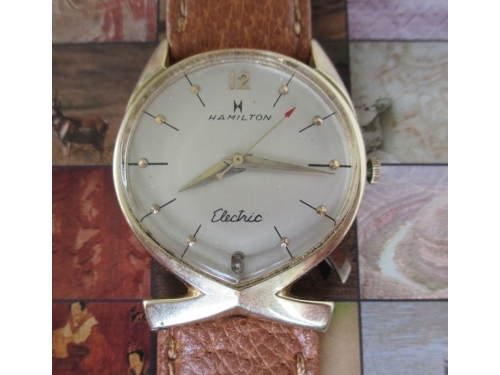 This is really quite a bargain price for a solid gold asymmetrical Hamilton electric which has been SERVICED. I have seen examples on the 'net of this watch at twice the price. Five new watches added to site; more coming! I've added five new watches to the website today. If you are a Hamilton collector, you're in luck because three of the five are Hamiltons! The new additions include two electrics, both 14kt solid gold. One is a Spectra with Cal. 500 movement, just serviced. The other is a Polaris with 505 movement. The third Hamilton is a beautiful Drake in white gold fill. The other two new watches are a Gruen Curvex 46mm; and an Omega bumper automatic, Ref. 2635-1, circa 1950s. Check them out! I have about 15 other new pieces ready to list, or in the shop getting tuned up. However, I did not want to list all the watch at once; they will be spaced out over the next month or so. Just off the presses: Elgin Wristwatches: A Collector's Guide. First reference devoted exclusively to Elgin, with nearly 900 models from 1932 to 1962 identified. Get your copy today. New Hamilton wristwatch book draws praise from collectors worldwide. Get your copy today.